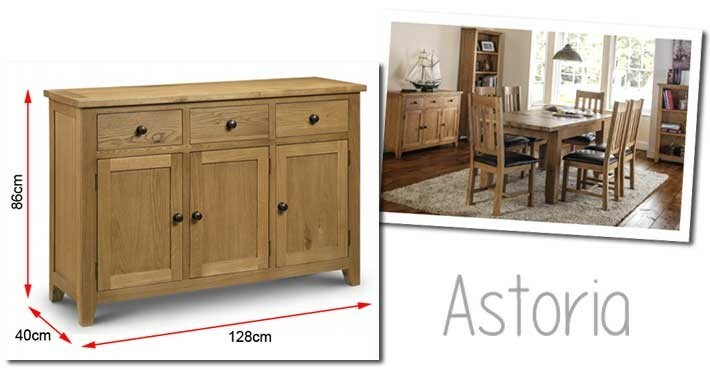 The Astoria sideboard gives you plenty of concealed, practical storage space for the room of your choice. Three cupboard spaces offer storage for larger items whilst three top drawers are ideal for tidying up the clutter and items you need quick and easy access to. The smooth rectangular surface top is perfect for displaying some of your favourite ornaments or photo frames. Question from Robert Leacroft: Asked on 09/01/2016 Hi, Can you confirm that absolute maximum width of Astoria Sideboard is 1280mm. I have a recess 1285mm which I hope to fit it into. Answer from LucyConway Hello Robert, Yes I can confirm that the maximum width of this sideboard is 1280 mm. If you type "sideboards" into the search bar at the top of the page we have a wide variety of sideboards with longer widths that may be of interest to you. Thank You, Lucy. Answer from LucyConway Hello Cath, Yes each cupboard has 1 shelf about half way down. Thank You, Lucy.